This year’s Brands by Value table ontinues to see a volume shift towards local brands from developing countries. The potential for these brands, especially from China, is immense and opportunities to develop variants to enhance margin – and, in turn, cross borders – remain. Margin growth remains with the global power brands however. 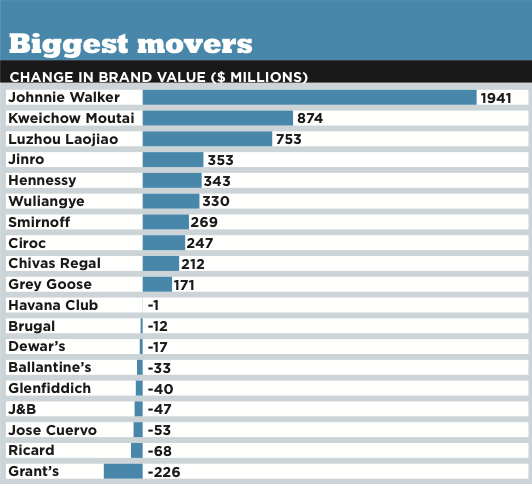 Johnnie Walker bestrides Brand Finance’s latest drinks league table like a colossus. More than $2bn clear of second place, its $4.37bn brand value represents unrivalled margin growth. With its emphasis on big ideas based on core category motivation and enhanced by innovation, its value growth means it is pulling away from international rivals. Exceptional growth of more exclusive variants such as Blue Label and the Double Black, which commands a 20% premium over Black Label, is partly responsible. Whisky brands account for more than a third of the total brand value in the top 50, with Scotch whisky pulling away from other whisk(e)y styles. The combined brand value of all featured whisky in the list is $14.29bn. This is more than the totals for the next three most valuable categories combined – vodka, baijiu and rum have respective values of $5.35bn, $4bn and $3.73bn. Cognac, liqueur and rum brands are next, making up 9% ($3.45bn), 5% ($1.78bn) and 3% ($1.34bn) of the total brand value. Cîroc, the ultra-premium vodka, has seen the largest jump in ranking, rising 16 places to number 19 thanks to an 82% increase in brand value. The main driver of this growth can be attributed to clear positioning as the ‘celebration’ drink to be seen with. Celebrity Sean ‘Diddy’ Combs is the brand’s part owner and spokesperson. Case sales were 2.1 million in 2012 compared to only 400,000 cases sold four years ago. As part of a brand valuation exercise, the strength of a brand is evaluated against its peers across a number of measures, including emotional connection, financial performance and sustainability, among others. This is used to arrive at a brand rating which ranges from D to AAA. 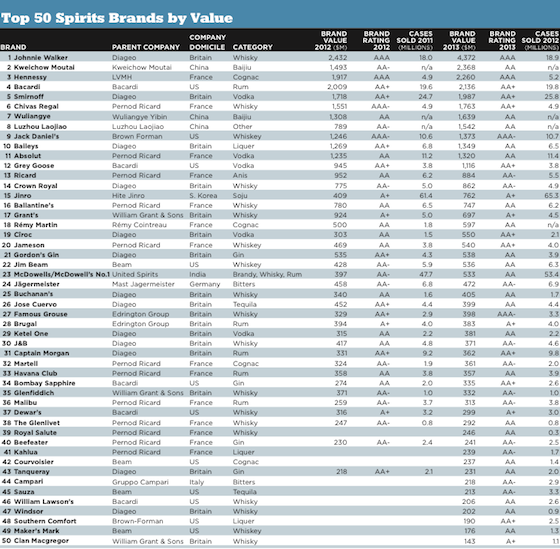 Johnnie Walker, Hennessy, Jack Daniel’s and Famous Grouse achieve AAA brand ratings. This puts these brands in an exclusive club of brands that have the most potent hold over consumers in their sectors. Brands with similar ratings in other sectors include Ferarri, Apple, Disney and Manchester United. With European market volume flat, emerging markets continue to be essential for brand value growth. McDowell’s collective case sales (rum, brandy and whisky) rose 5.7 million to 53.4 million. India’s most valuable drinks brand continues to capitalise on burgeoning domestic demand and has improved both its brand value, now AA, and its position against other global players, moving up two places to 23rd. South Korea’s Jinro has seen sales of its soju increase by 3.9 million cases, fuelling impressive brand value growth of $353m.